The Palo Verde Cancer Center Scottsdale can treat the entire spectrum of breast cancer patients with its TomoTherapy HD System. Unlike conventional radiation therapy machines that deliver wide beams of radiation from only a few angles, the TomoTherapy System offers greater flexibility and more precise treatments. With TomoTherapy technology, your doctor can choose to deliver radiation continuously from all angles around your body to treat complex breast cancers or from fixed angles to address more common tumors. Instead of a single beam of radiation, the TomoTherapy HD System is designed to divide radiation into smaller beamlets, enabling a treatment plan that is optimized for delivering maximum dose to the breast. Through its unique treatment delivery system, the TomoTherapy HD System can minimize the damage to healthy tissue and organs around the breast, such as the lungs and heart. 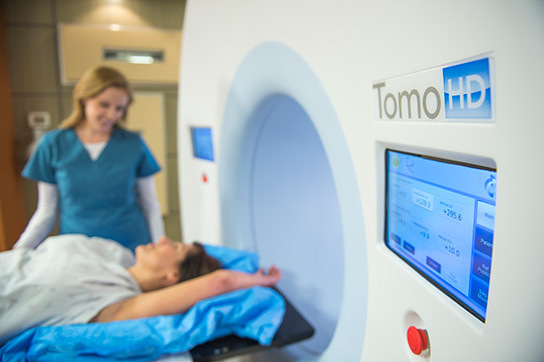 The Palo Verde Cancer Center Scottsdale utilizes the TomoTherapy’s daily imaging capabilities to assure treatments are delivered with extreme accuracy. This precision results in fewer side effects, and typically allows patients to continue their normal daily routine throughout the course of treatment. To find out if TomoTherapy treatments are right for you, contact the Palo Verde Cancer Center Scottsdale at (480) 941-1211.